My colleague Robert Soden was absolutely right: Tomnod is definitely iRevolution material. This is why I reached out to the group a few days ago to explore the possibility of using their technology to crowdsource the analysis of satellite imagery for Somalia. You can read more about that project here. In this blog post, however, is to highlight the amazing work they’ve been doing with National Geographic in search of Genghis Khan’s tomb. This “Valley of the Khans Project” represents a new approach to archeology. Together with National Geographic, Tomnod has collected thousands of GeoEye satellite images of the valley and designed a simple user interface to crowdsource the tagging of roads, rivers and modern or ancient structures they. I signed up to give it a whirl and it was a lot of fun. A short video gives a quick guide on how to recognize different structures and then off you go! You are assigned the rank “In Training” when you first begin. Once you’ve tagged your first 10 images, you progress to the next rank, which is “Novice 1”. The squares at the bottom left represent the number of individual satellite images you’ve tagged and how many are left. This is a neat game-like console and I wonder if there’s a scoreboard with names, listed ranks and images tagged. 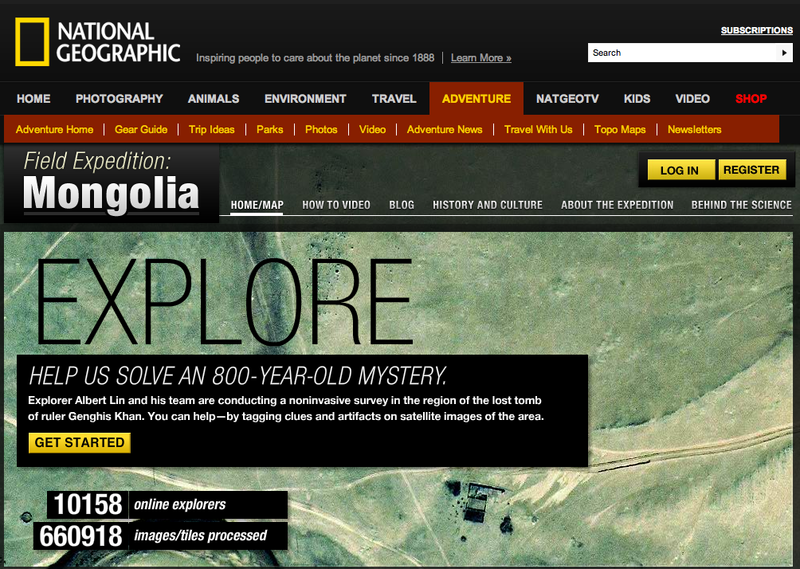 In any case, a National Geographic team in Mongolia use the results to identify the most promising archeological sites. The field team also used Unmanned Areal Vehicles (UAVs) to supplement the satellite imagery analysis. You can learn more about the “Valley of the Khans Project” from this TEDx talk by Tomnod’s Albert Lin. 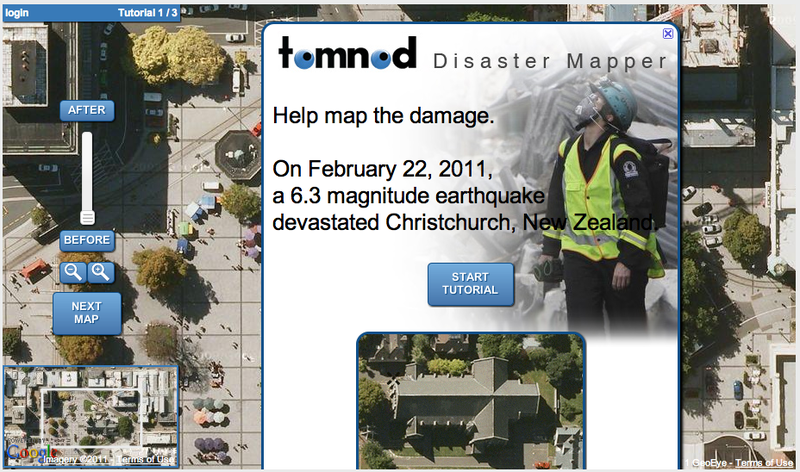 Incidentally, Tomnod also offered their technology to map the damage from the devastating earthquake in New Zealand, earlier this year. But the next project I want to highlight focuses on the forests of Borneo. This is a really neat project and I’ve just signed up to participate. EarthWatchers has designed a free and open source platform to make it easy for students to volunteer. 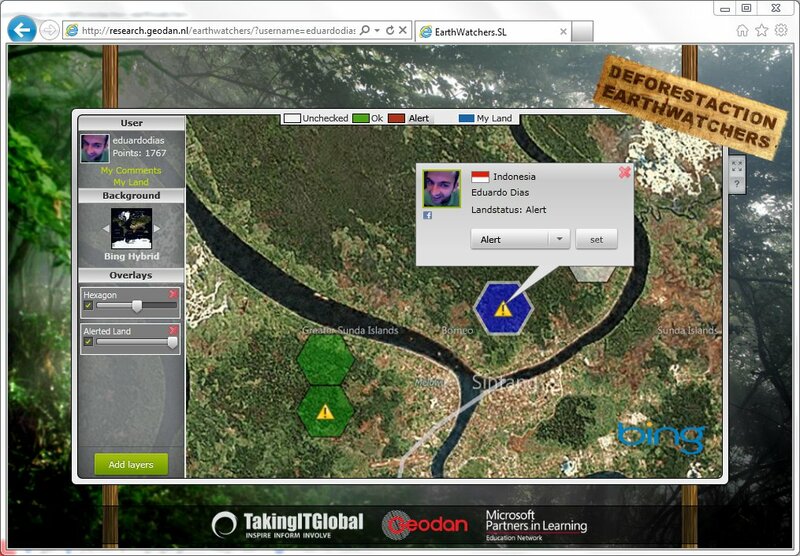 When you log into the platform, EarthWatchers gives you a hexagon-shaped area of the Borneo rainforest to monitor and protect using the satellite imagery displayed on the interface. The platform also provides students with a number of contextual layers, such as road and river networks, to add context to the satellite imagery and create heat-maps of the most vulnerable areas. Forests near roads are more threatened since the logs are easier to transport, for example. In addition, volunteers can compare before-and-after images of their hexagon to better identify any changes. If you detect any worrying changes in your hexagon, you can create an alert that notifies all your friends and neighbors. An especially neat feature about the interface is that it allows students to network online. For example, you can see who your neighbors in nearby hexagons are and even chat with them thanks to a native chat feature. This is neat because it facilitates collaboration mapping in real time and means you don’t feel alone or isolated as a volunteer. The chat feature helps to builds community. If you’d like to learn more about this project, I recommend the presentation below by Eduardo Dias. The third and final project I want to highlight is called Galaxy Zoo. I first came across this awesome example of citizen science in MacroWikinomics—an excellent book written by Don Tapscott and Anthony Williams. The purpose of Galaxy Zoo is to crowdsource the tagging and thus classification of galaxies as either spiral or elliptical. 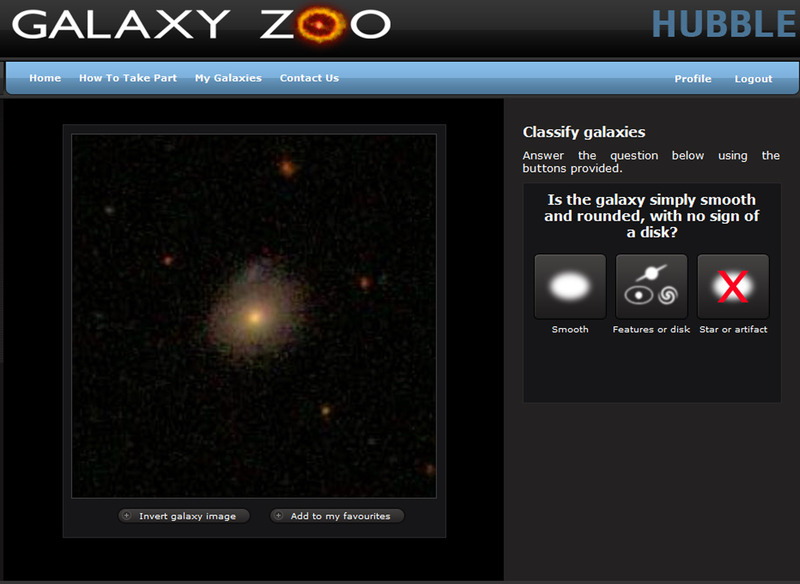 In order to participate, users to take a short tutorial on the basics of galaxy morphology. While this project began as an experiment of sorts, the initiative is thriving with more than 275,000 users participating and 75 million classifications made. In addition, the data generated has resulted in several peer reviewed publica-tions real scientific discoveries. While the project uses imagery of the stars rather than earth, it really qualifies as a major success story in crowdsourcing the analysis of imagery. Know of other intriguing applications of crowdsourcing for imagery analysis? If so, please do share in the comments section below. This entry was posted in Big Data, Crisis Mapping, Crowdsourcing, Satellite Imagery and tagged analysis, Borneo, Deforestation, EarthWatchers, GalaxyZoo, Geographic, Imagery, Mongolia, National, Satellite, Tomnod. Bookmark the permalink. Very nice post, Patrick. We also are looking at possibilities like these you showed to write stories about the Amazon rainforest. Unfortunately, in the official history there are many pro-Chinese falsifications about “a war between the Tatars and Genghis Khan” etc. So probably not there looking for the Tomb of Genghis Khan – that’s it, and can not find it. Very most likely, it is in other part of Eurasia. As a matter of fact, most of the descendants of Genghis Khan and hisnative nation, living now among the Bashkirs, Kazakhs, Tatars, and other Turkic peoples. There are a lot of previously little-known historical facts, as well as 16 maps and illustrations in this book. On the cover of this book you can see the true appearance of Genghis Khan. It is his lifetime portrait, which is very little known.